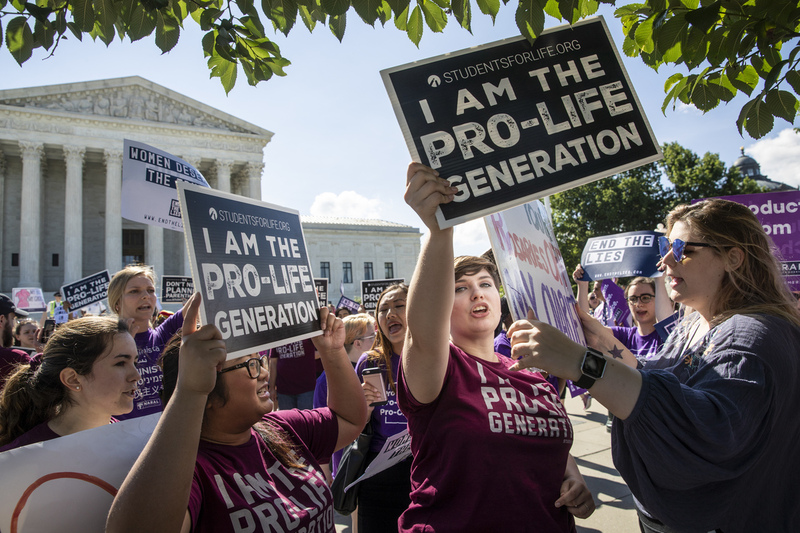 Supreme Court Sides With California Anti-Abortion Pregnancy Centers In a case that pitted the right to know against the right of free speech, the court ruled 5-4 that a California law aimed at "truth in advertising" likely violates the First Amendment. Anti-abortion-rights advocates demonstrate in front of the Supreme Court early Monday. In a 5-4 ruling, the court said the centers are likely to succeed in their claim that the law violates the First Amendment. That overturns an earlier decision by the Ninth Circuit upholding the law and sends the case back for further consideration. Writing for the majority, Justice Clarence Thomas said the law "targets speakers, not speech, and imposes an unduly burdensome disclosure requirement that will chill their protected speech." Supporters of the California law called the state's effort nothing more than seeking "truth in advertising." But anti-abortion pregnancy centers saw the law as unconstitutional, compelling speech that turns them into mouthpieces for a government message they disagree with. It was a galvanizing issue for social conservatives in 2016. Many supported then-candidate Donald Trump, despite concerns about his character and temperament, in an effort to fill the court with conservative justices. Trump delivered on that goal with his appointment of Neil Gorsuch soon after taking office. Reacting to the high court ruling, NARAL Pro-Choice America President Ilyse Hogue said in a statement that the court "turned its back on women" and highlighted the high stakes for future decisions. "One vote made all the difference today, and it could also be the only thing between upholding Roe or outlawing legal abortion in America," Hogue said. "Fake women's health centers, with the rest of the well-funded and well-connected anti-choice movement, have been working towards this moment for decades. They have carefully put the pieces together — passing radical and unconstitutional abortion bans, stacking the lower courts — because they are counting on Trump's Supreme Court to overturn Roe v Wade. Roe is at greater risk than ever before." Abortion-rights opponents praised the decision as a victory for free speech. Penny Nance, CEO of Concerned Women for America, said in a statement, "To be clear, this case was not about abortion. Malicious abortion politics definitely were the motivation behind it, but the case centered on the inappropriate mandate of the state compelling pro-life clinics to promote abortion in violation of their consciences. The case was about forced speech." The impetus was twofold — first, allegations that pregnancy centers opposed to abortion were using deceptive practices; and second, concern that lower-income women, in particular, weren't aware of the free pregnancy-related services California provides, from prenatal and delivery care to birth control and abortion. The FACT Act requires unlicensed crisis pregnancy centers to post a sign or otherwise disclose to their clients in writing that the center is not a licensed medical facility and has no licensed medical provider who supervises the provision of services. The disclosure requirement extends to advertising, which anti-abortion pregnancy centers objected to as an attempt to "drown out" their message. The second provision of the law, dealing with licensed centers, requires clinics that do not provide a full range of reproductive care, including services covered by Medicaid, to post a sign that says the state provides free or low-cost access to prenatal care, birth control and other reproductive care, including abortions. In recent years, the number of pregnancy centers that counsel against abortion has dramatically increased. There are about 2,700 of them across the country, more than three times the number of clinics that provide abortions. There is no data on how many of the 2,700 anti-abortion pregnancy centers are unlicensed. But unlicensed clinics offer pregnancy tests and limited ultrasounds, and, to an unskeptical eye, they can look very much like a licensed medical facility. The personnel wear surgical scrubs or white coats and ask clients to fill out medical history questionnaires. Indeed, many clinics locate next to or across the street from a full-service women's reproductive health center and some use similar-sounding names.